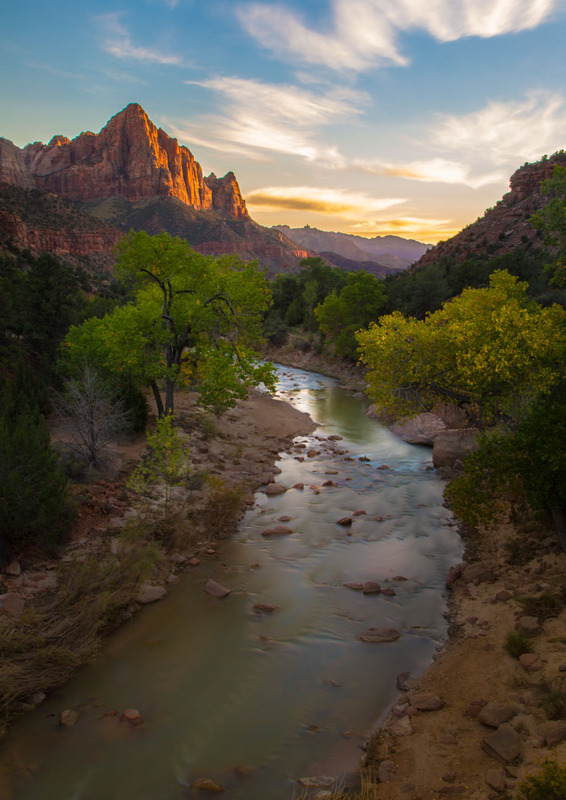 Zion is the most popular of the Utah National Parks. 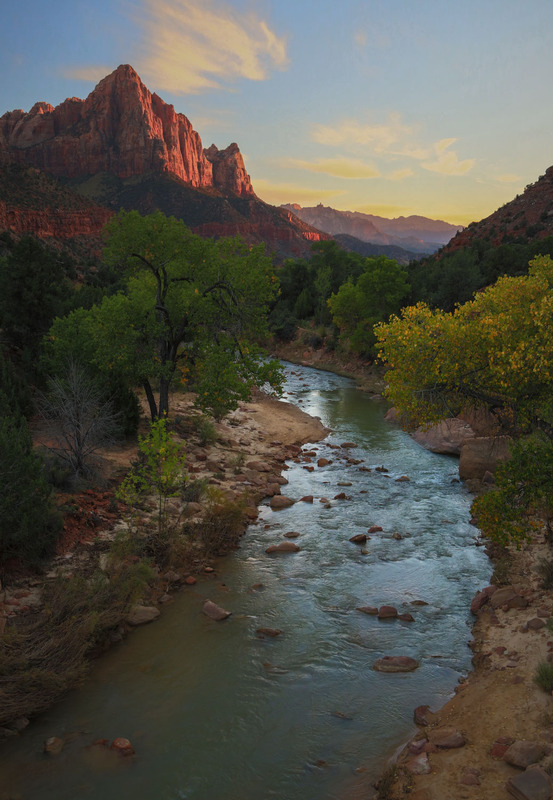 And the classic location of the Virgin River and Watchman is likely the most photographed. When shooting a river or stream, the flowing water can evoke various moods depending on how you adjust your shutter speed. 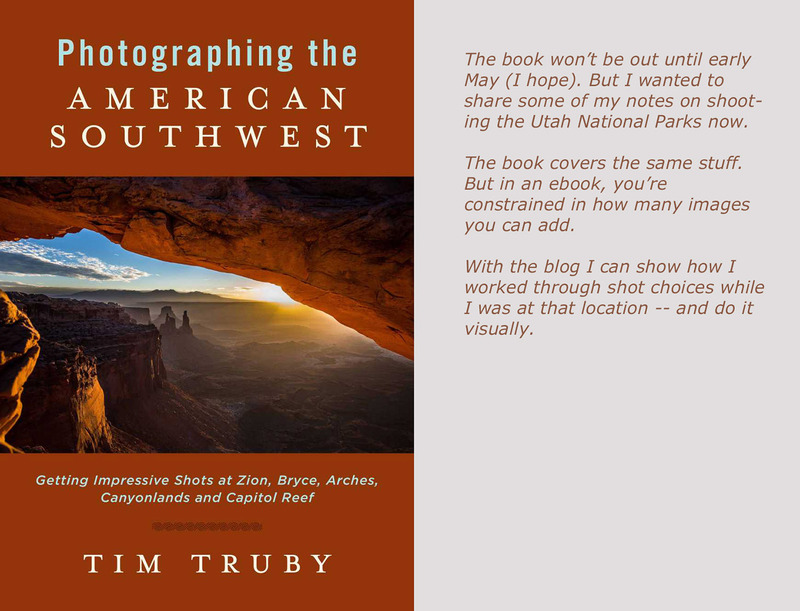 Getting There: Zion NP is in southern Utah about 40 miles off of Interstate 15. You get onto Utah Route 9 and at the far end of the resort town of Springdale, you’ll find the park. For most of the year, the park is accessed by the park buses. So park at the Visitor Center, hop on the shuttle and get off just after the Canyon Junction bus stop (just past the bridge over the river). Walk back to the bridge and set up on the south side and away from the road. 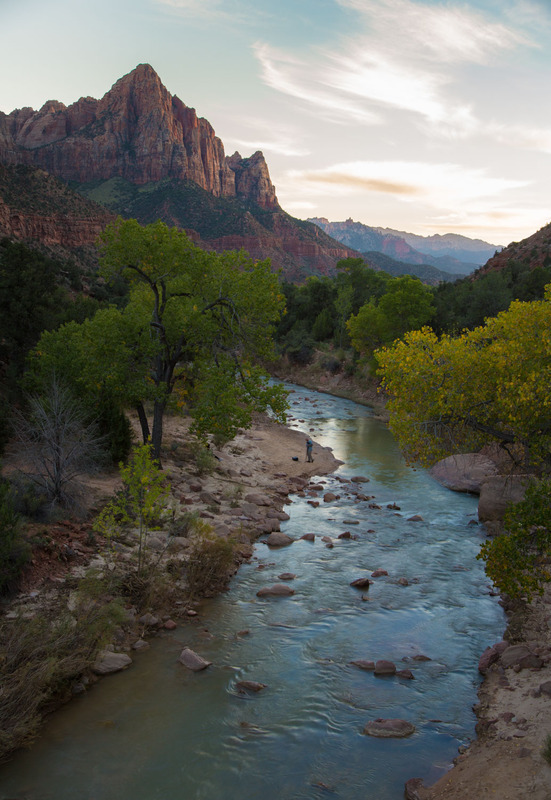 The shot is of the river below, and in the distance, The Watchman, one of the iconic Zion peaks. The best time for the shot is sunset. If you just want the picture, you don’t need a tripod. But if you want to play with shutter speed, you kinda need a tripod and a cable release (or you camera’s timer function). Notice that at 1/40, the stream is totally frozen, no discernible blur. You’re getting lots of colors in the water from the trees and sky. And every little ripple and detail of that stream is clear. Now, don’t look at the photographer who wandered into my shot. And I won’t tell you what all the photographers on the bridge were saying while he stood there for 20 minutes. We’re just looking at the water. And at half a second, the water no longer has as much detailing. You’re eye doesn’t get as caught up in the minute ripples. But there’s still plenty of detailing in the surface of the stream. In fact if I hadn’t added the shutter speed setting, the viewer would assume this image is pure stop action. Obviously 8 seconds is a lot. And you can’t make this shot work if there’s any wind. But the river still looks like a real river. All the standing waves are there as are the reflections. But the minute texturing of individual waves is gone, especially in areas without rocks. Essentially what we’re doing is showing the eye how a river looks in time. In fact, we could take a shot with a 60 minute shutter speed and we’d still see the same set of standing waves. And subjectively, the shot does evoke more of a timeless feel than it did with a faster shutter. Is the shot as “honest” as one with a fast shutter? Is a slower or longer shutter speed more true to life? That’s the wrong question to ask. The real question is, how does the viewer respond to a given image. If the change doesn’t seem weird or “fakey” to the viewer then the photograph will work for them. — The willing suspension of disbelief, to quote Aristotle. The second question is, what’s the effect I’m going for? That’s ultimately what matters. I go back and forth on how much I want to push the shutter speed. For some river situations, a slow shutter focuses too much attention to the turbulence. But in a slow moving river that’s not an issue. Generally most viewers don’t mind the effect. But this is just one element in a larger set of artistic considerations. In this shot I was trying to capture a feeling I have about Zion, that when I come, I’m in a timeless place. And the image gives me some of that feeling– a tranquil river flowing through a place that has been this way always. But each of us has to make that shutter speed choice (and all our compositional issues) based on the mood we want to share in that shot. And there’s nothing wrong with exploring your choices.